HTC has just rolled out what looks to be a great challenge to the iPad. I have not had a chance to handle the unit yet, but for a traveling photographer, it looks quite compelling on their website. The unit measures 4.8" x 7.7" and weighs under one pound. 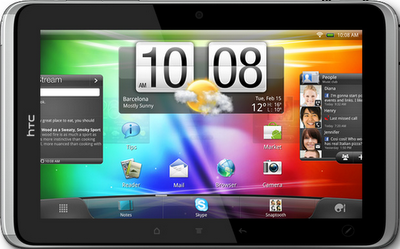 The display is a 7 inch touch-sensitive screen with 1024 X 600 resolution. Power comes from a 1.5 GHz processor, 32 GB of storage and 1 GB of RAM. A microSD™ memory card (SD 2.0 compatible) gives you additional storage if needed. Of special interest to photographers, it comes equipped with a 5 megapixel color camera with auto focus and a 1.3 megapixel front camera. Video is captured at 720p HD. Sounds like a winner if the unit is as good as it's pictured. Stay tuned for a hands-on test. In Cleveland, HTC is handled by all the major cellphone distributors: AT&T, Sprint, Verizon, Alltel and T-Mobile.